Paul McCartney plays Hey Jude...for Jude! Think Macca pays for premium? As most music fans know, Sir Paul McCartney wrote one of the most beloved of all Beatles' songs, Hey Jude, for John Lennon's son, Julian. But the other day, McCartney got a chance to play it for a boy whose real name happens to be Jude. McCartney was in Amarillo, Texas, during a US road trip along the iconic Route 66 he's taking with girlfriend, Nancy Shevell. While walking past a record store, he was approached by the shop's owner, Don Dunavin, who was holding his son, Jude. According to Dunavin, "Paul went to Jude, grabbed his hand and started talking to him. After we told him his name he said, 'I've got something for him.'" And with that, McCartney whipped out a harmonica and started playing Hey Jude. "Jude was smiling at him," says Dunavin. "I told my wife to get the camera out and he stopped. He said, 'Please, no pictures.' But then started playing some more." Dunavin's wife, Lori, added: "Now it doesn't matter if Jude gets teased. The man himself played the harmonica for him." 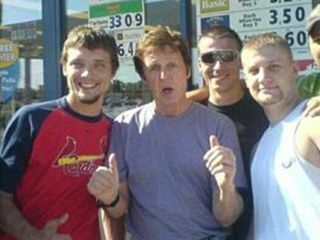 McCartney has been surprising others during his American road trip. The other day, while passing through Springfield, Illinois, he shocked a group of fans at a service station. Those folks, however, were lucky enough to get their photo taken with the ex-Beatle.